Ford Mondeo ST 24 “Black Bess” from Jonathan Summers on Vimeo. Some friends had a bachelor party – stag do in the local language – which involved a long, adventurous drive in cheap old cars. I wasn’t attending the party or wedding, but my black Mondeo was, and showing an unexpected turn of speed for something so close to the automotive knackers yard. For more years than I care to remember, I have made a pilgrimage home to England each Christmas. Typically this trip involves renting a car. This experience is always fraught; one can either pay a premium for company which offers to guarantee you a particular make/model: my experience here is that you’re unlikely to get what you were promised, whatever the company tell you, even at a big airport like Heathrow. Alternatively, throwing caution to the wind, and taking what Fate Might Offer, saw me battling icy motorways in a car with puny 165 section tyres; it slipped around so much I was convinced the tyre pressures were off. Picture me squatting at the tire pressure machine in the frigid rain of Reading services at 11.30pm, only to find the issue was merely the narrow tires. In the US, specifying a high group usually allows you to choose from whatever they have at that location at that time, but European rental fleets are smaller, so too often your “luxury” group car translates to a 7 seater minivan, and no options. There are companies offering premium car rental, but these seem to be punitively expensive, and have mileage limits which imply you should use the car to show off at the golf club, not try Plymouth to Edinburgh overnight. I love cars and driving too much to spoil the motoring experience with cars which aren’t any fun. There just had to be a better way. When I tell people I decided to take the budget I would normally use for a rental car, and use it to buy a cheap fast car, they always say “Oh like, like on Top Gear”, but no, this was NOT like Top Gear. Top Gear have a chase truck with mechanics; I had basic tools, and a newly acquired California Smog tech qualification; they have a camera crew, a production team, while I had only the ire of the Boss, who described the plan as “retarded”, and vowed and end to our union if she was in the car when it stranded us. From my apartment in California I surfed cheap cars in England, cars where four or five full tanks of gas at UK prices would cover their purchase price – Alfa 146 Cloverleafs, Fiat Coupe Turbos, Vectras and Mondeos. Tons of Vectras and Mondeos….slowly I realized that the cars I had abused as a young sales rep were now at the end of their lives, the five hundred pound bangers, in the V6 / sport suspension form which the company hadn’t permitted me in period. Now I was possessed with car buying lust. Since the trip was over Christmas, it would be cold and wet outside, my courage to do Italian failed me, and thoughts of stick shift Jaguars gave way to pragmatism; Fords and Vauxhalls are common, making parts/repair much easier; Vectras never could corner, so I restricted my search to the Mondeo ST24s I had loved when both the cars and the driver were younger, less saggy and more full of vim and vigour. I planned to look at two cars, the black one, and a red one. The red one looked cleaner, but it was further away. The price on the black one was better; it looked as if someone had poured acid on the bonnet; the seller’s wife had a quarrel with a concrete post in Sainsburys, and the Mondeo’s bumper had come off worse. The car was parked up at the bloke’s work, in St Albans; the whole family arrived since they were on their way out Christmas shopping. I was not looking for a clean car, just one which was in regular use, and was therefore likely to continue to function during my seven week stay in Blighty. We were close by the M25, and my test route took me down onto it. Annoyingly there were cameras preventing any proper test of the car, and it was absolutely miles to the next junction. Hence some anxious moments for my mate who had given me a lift to see the car, and the seller – I was gone an awfully long time. There were some anxious moments for me too when I saw how empty the petrol tank was – just what I need running out of petrol on the hard shoulder in someone else’s car….. arriving at last at South Mimms, I threw five quid in the car, and then took it out on the A1M. It pulled strongly beyond a ton; it tracked straight, and braked straight. The gearbox was sweet, the clutch light. Around the roundabouts, it felt tired but still predictable. 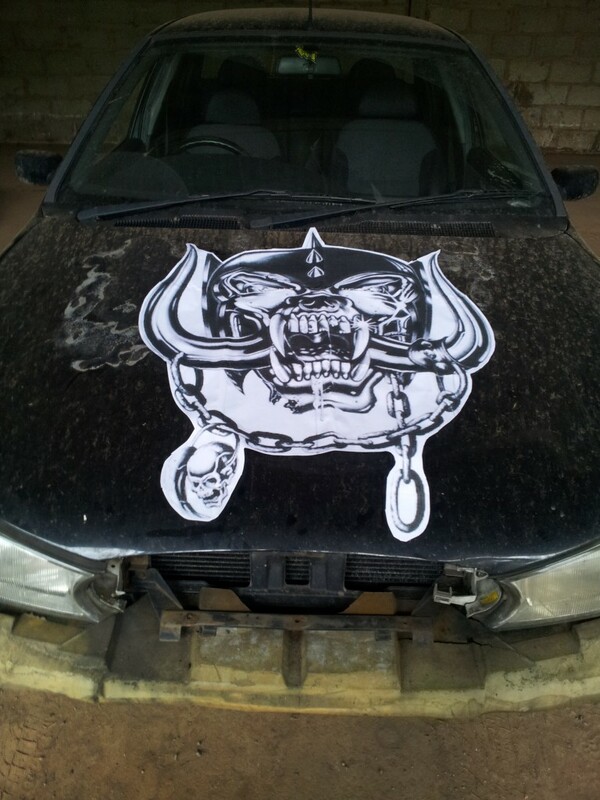 The central locking didn’t work properly, but it could be persuaded. The wipers and lights were fine, although the Sainsbury’s tussle seemed to have necessitated a new headlight. It didn’t seem to have oil in the sump, and that alone should have been a reason to walk away, at least look at the red car. But by now, I was in love. And I’ve never liked red cars. When I got back we struck a deal. I didn’t negotiate too hard – the asking price was within my budget, and the family clearly needed the odd fifty quid more than I did – they were using it for that Christmas shopping. A Merry Christmas all round, then. Jim Clark room, Duns, Scotland, January 2012 from Jonathan Summers on Vimeo. On this trip I fulfilled a long held desire to walk Hadrian’s wall. 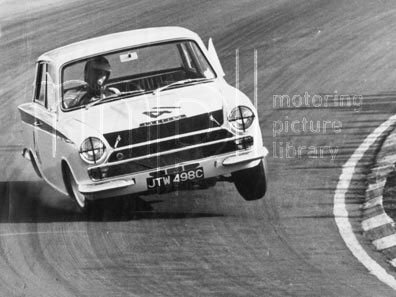 In planning this, I realized I was within reach of Duns, and the Jim Clark room, the museum commemorating the life of perhaps the Greatest Formula 1 driver, forever immortalized for me in a photo taken at Brands Hatch: he’s four wheel drifting a Lotus Cortina, it’s inside front wheel pawing the air, perfectly balanced. There was something else I wanted to explore here in Scotland: for such a small nation, in terms of population and geography, there have been an awful lot of really good Scotts motor racing drivers. I wondered, could it be the roads they grew up driving on ? 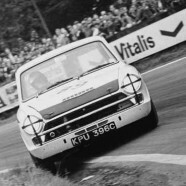 Clark raced Lotus Ford in Formula 1 and at Indy, and drove Lotus Cortinas on the road too, keeping one at the small airport near his home when he was racing abroad. This was serendipitous – as the performance version of Ford’s bread and butter family sedan, surely my Mondeo ST is a spiritual successor to the Lotus Cortina ? The perfect tool to channel Jim Clark. North of the border, the A Road was fast, sweeping, and pretty scenic too, and in those moments I was utterly vindicated, so pleased I had spurned rentals, with their tiresome need-another-gear-at-4,000rpm diesels and had the hallowed combination of a manual transmission and a gas motor. The roads were quiet enough to make rapid progress, with trucks and DSJ’s “mimsers” easily passed – really excellent motoring. I stayed in a old coaching inn / pub right on the main road. The following morning was crisp and damp, and my route took me straight across a moor of somesort – indeed, it reminded me of roads across Dartmoor, with their cattle grids and crowned centres. There wasn’t much traffic and the moors are open, the roads unfenced; often, you can see a long way ahead, allowing use of the full width of the road/proper racing lines. Many sections allowed quite high speed – over one crest I felt the Mondeo leave the ground, or at least get close to it judging by the crashing and banging when it settled on its springs once more. Before I arrived at the museum, I had my answer – emphatically yes, the roads here certainly helped hone the skills of a Stewart or a Clark. The Jim Clark room is really a trophy collection, augmented by some great photos. But, of course, the trophies tell us Clark’s story, the ascent of a Champion, farm boy to household name. Small cups awarded at local events to three Formula 1 Drivers Championships. A giant clock he won at Indianapolis. I had spoken to the curator, Andrew Tulloch, in advance, and he opened up for me and gave me a few hours of his time; Stewart and Franchitti are involved with the museum, and he has written a book on Clark (http://www.amazon.com/Jim-Clark-Grand-Prix-Legend/dp/0297854402). I bought one, but shame on me, I’ve yet to read it. The best thing about this visit were Tulloch’s stories around the research he did for the book – he had been and interviewed friends and family, many of whom still live locally. We spoke about Monza 1961, when Clark and von Trips tangled with horrific results. “I don’t think von Trips thought he was there…..I mean, the Ferrari had a lot more horsepower, by rights, Clark shouldn’t have been able to challenge there….”. When Clark came home from Italy, he went straight out into the fields to work. Clark himself was from a town called Chirnside, a short drive away from the museum. Rolling into the town, there was a small general service garage. Parked up outside was a rather dog-eared rally prepared Sierra Cosworth. Keep that flame burning. The church and churchyard are exactly as you would hope they might be: green and grey and looking unchanged for decades. It took me five or ten minutes to find the grave. It says much about Clark that the headstone describes him as a Farmer before Three Time World Motor Racing Champion. There’s something of a Roman hero, or George Washington about this, that having ventured abroad in the world, been Champion, forged a nation, all they wanted to do was return to their farms. They were farmers first; by implication, that was how they still defined themselves. During this stay I also spent a few days in London. The Boss had booked us a nice hotel in Kensington, which had valet parking. It probably cost the same per night as I had spent to buy the car. 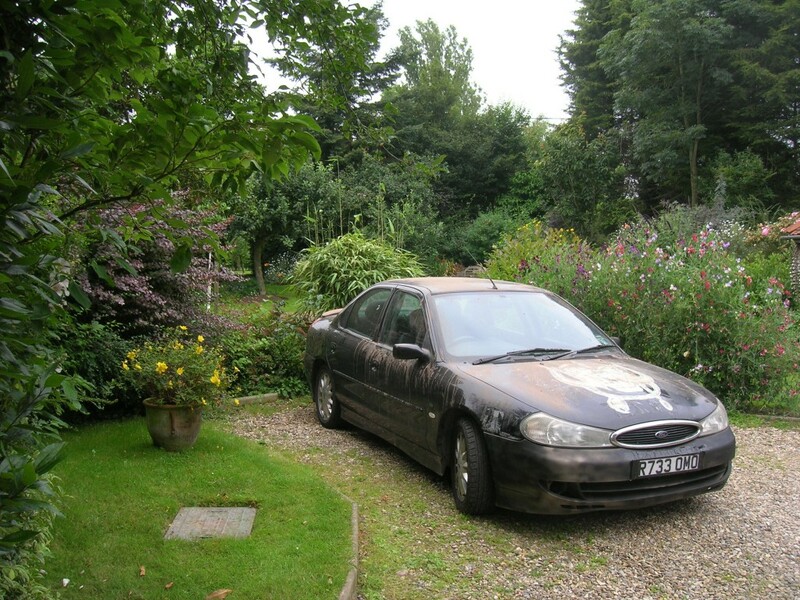 At that time the Mondeo was particularly travel stained, still sporting the “acid attack” motif on the bonnet and had the front bumper attached on the Sainsbury’s side with duct tape. It fitted right in amongst the new Audis and Porsches in front of the hotel. The valet approached, and gave me the check, which had plan and elevation diagrams of a car, and pointing to this, he advised me to “Please mark where there is previous damage”. The poor chap kept a straight face even when I guffawed, and the Boss rolled her eyes and walked inside to check in. The joke, however, was perhaps on me since when we checked out, they told us that they had been unable to lock the car – I had neglected to tell them the central locking would only operate properly from one of the backseat doors…..